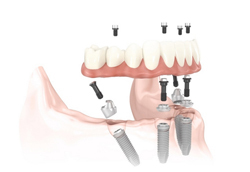 Dr. Richard Nejat, Dr. Eugenie Lee, and Dr. Daniel Nejat are highly experienced New York City dental implant providers who have helped thousands of patients restore strong and healthy teeth. 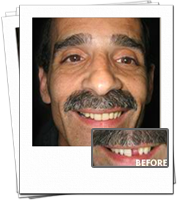 Whether you are missing one tooth or suffer from loss of all your teeth, the talented dentists of Advanced Periodontics & Implant Dentistry can help you achieve a beautiful smile. 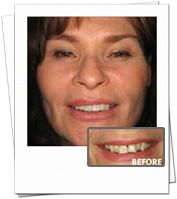 They perform advanced restorative techniques that deliver fast results, such as the sophisticated Teeth-in-an-Hour and Smile-in-a-Day™ treatments. As board-certified Periodontists, they also offer an array of gum treatments such as, laser gum surgery, laser gum depigmentation, and gummy smile correction. 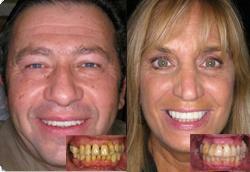 Teeth in an Hour is an innovative procedure that replaces your missing teeth in just one visit. 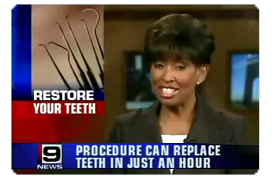 Watch Dr. Richard Nejat demonstrate Teeth-in-an-Hour on Channel 9 News. or want to prevent it from developing in the first place — our trained and experienced Periodontists are here to help. Our state-of-the-art dental facility is fully equipped with the latest and most advanced technology in dental implant and periodontal care. Among the most innovative treatments we offer are digital X-rays, computer-guided implant surgery, and laser dentistry, which make for enhanced precision and accuracy in diagnosing and treating an array of dental issues. Treatment is quicker, more comfortable, and above all else, safer than ever before. If you would like to learn how dental implants can help you turn your cracked, chipped, discolored, or missing teeth into an attractive smile, schedule a personal appointment at Advanced Periodontics & Implant Dentistry. You can set up your appointment with one of our talented NY / NJ dental implants providers — Dr. Richard Nejat, Dr. Eugenie Lee, or Dr. Daniel Nejat — by clicking here or calling now.